If you want proof of American criminal conduct in Syria, look no further than the events of yesterday when a group of ISIS grubs set off from American-occupied Al-Tanf on motorcycles in the direction of the Western Plantations with their goal being to reinforce ISIS positions near Al-Raqqa (via the Abyadh Al-Tuwaynaan Valley) where the other pro-American SDF is located. Talk about playing two sides against the other! The ambush was sprung about 30 kms west of Palmyra (Tadmur) by elements of Air Force Intelligence-Special Operations Units. The terrorist rodents were especially vulnerable on their motorcycles as expertly positioned commandos opened light arms fire at them killing two instantly and forcing another two to wipe out on the road. The two taken into custody started warbling like nightingales explaining their relationship with American officers at Al-Tanf. The second ambush took place in the area of Al-Furoo’ east of Palmyra by about 70 kms. There, the terrorists were not so interested in confrontation. They surrendered to the Security Services commando units and gave up 10 motorcycles, weapons and ammo, 146 rolls of hashish, 14 bags of Captagon which amounted to 10,000+ tablets. I guess they were going to cater a party. They are now warbling like starlings. Now that a new prime minister in Iraq is in office, we are hoping the Baghdad government stops affording the U.S. privileged status permitting it to supply and occupy the Al-Tanf base. The Hashemites in Jordan are a lost cause, but, Iraq is not yet that far gone. There is still hope that Muqtadaa Al-Sadr and his allies will re-assume their mantles as Iraq’s only truly populist movement. The U.S. has been truly injured by the fall of Al-‘Abbaadi’s government after so many lobbying efforts – efforts to intervene in Iraqi elections. The night before yesterday, somebody fired some rockets at a military research-and-development center in Latakia. Syrian radar picked up the approaching missiles and fired Pantsir anti-missile rockets at them, bringing most down, according to sources in Latakia. Yet, the atmosphere is still somewhat murky. That evening, amidst the melee, an Ilyushin aircraft carrying 14 crew members and enlisted men was downed in the Mediterranean near the coast of Syria. A search and rescue operation is now in progress. This is what happened. Nobody was expecting any attack by the Zionist Settler State. There were no weapons being transferred to HZB from any research center in Latakia City. The Humaymeem AB was on alert, as usual, but, as I wrote, there were no causes for concern. A French missile boat was in the international waters outside Syria’s coastline and there was no expectation it would fire at any target, especially where there was a danger of striking Russia’s military. The French ship was the Auvergne, an Aquitaine Class ship. If any of you remember your history, it was at Aquitaine (then northwards to Poitier and Tours) where Charles Martel blunted the Umayyad Caliphate’s effort to conquer Europe from Andalusia in 732 AD. Well, anyways, there is a lot of history behind that name. Zionist military planners noted that the Il-20 aircraft was scheduled to depart Humaymeem at around 5 p.m. It would be the perfect cover. The attack on the research center was approved by Prime Minister Mileikowski (a/k/a Netanyhu). When the Il-20 was in the air, so were 3 F-16s. The idea was to shadow the transport aircraft and fire at the base. But, what happened became a nightmare. Syrian air defense units were not told about the Russian airplane. When Zionist aircraft appeared on their screens, they perfunctorily fired at the targets. It is evident from the swift Zionist retreat that there was realization that Syrian air defense missiles could hit the Russian aircraft. And they did, causing the Ilyushin to crash into the Mediterranean. Initial Russian reaction was to blame the French who were accused of firing cruise missiles at Latakia even though the “false flag” CW event had not taken place. This could mean that the CW event was scheduled to take place on Monday, but, that the Turkish-Russian agreement at Socchi aborted that. It is possible and it is an indication of just how incompetent the French really are. It is also obvious now that the Kremlin is fuming over this. Mileikowski constantly crows about how much coordination exists between Russian and Zionist forces in Syria. This was an example of how treacherous these Zionists really are. As you have said, the long anticipated false flag scenario is no longer realistic (in the near future at least) now that Putin and Erdogan have made a deal to create a real DMZ in Idlib. But the western & zionist buffoons didn’t like being outsmarted, so they struck any way they could, simply out of ‘pique’ and perhaps in the hope that Russia would respond aggressively. In this context, do you think Iran appears to have been ‘sidelined’ from those talks? Everybody is acting separately. Russians, Iranians, Syrians take care on their exclusive safety. No cooridanted defense of entire country will result with such events. Russians lost very valuable plane and next will follow after some apologies and other sorrows. And John has a nice expose on this incident. And John has a nice expose on this. Ziad: Janes raised the issue of information publicly accessible being possibly exploitable. I’ll vote for them in the 2019 Europe Song Context. 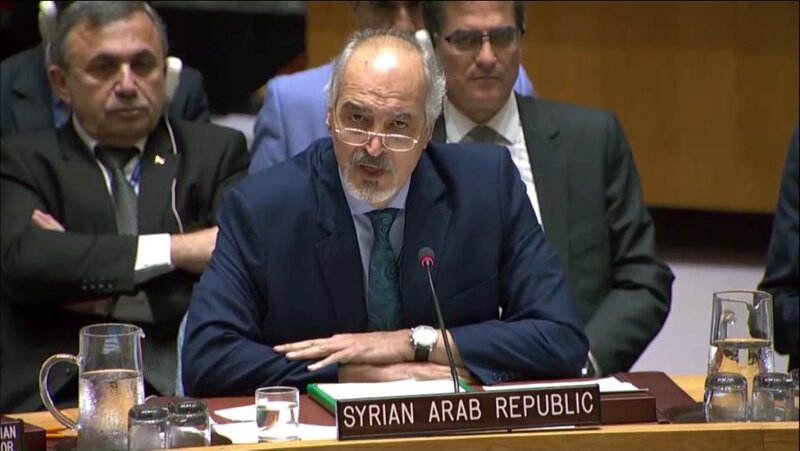 There is no representative of the ‘Syrian regime’ at the United Nations. How did Zionists know the flight plan of the IL-20 and thus be able to cobble together the alleged plan? That’s the key question for me. Tens of millions of Americans believe it already happened, by dark of night, rigged elections, bribed officials, Israeli trained militarized police, massive internet spying, dead end low paying jobs, a rigged game, a life of subsistence and slavery, and end to hope. The outlook for humanity is not good. Crises that should by now, not even exist in the 21st Century, they now affect every man, woman, and child on the planet. Still, reality never really sinks in for the people of the world. Hollywood and the PR gamers obscure the same evils humankind has endured for countless centuries. Meanwhile, the real villains escape the justice they so richly deserve. Here’s a window inside this cell you’ve locked yourself into, a view of inestimable treachery and evil. Last week Trump warned Russian and Syria not to attack Idlib. Trump faces perhaps his biggest test as president: whether he can resist his NEOCON advisers and not massively attack Syria. This is from last year, think about the logical conclusions in light of the il-20 incident. The Israelis, Saudis, and others who want unrest to endure are egging on the insurgents, assuring them that you, Mr. President, will use U.S. forces to protect the insurgents in Idlib, and perhaps also rain hell down on Damascus. We believe that your senior advisers are encouraging the insurgents to think in those terms, and that your most senior aides are taking credit for your recent policy shift from troop withdrawal from Syria to indefinite war. It is a day of infamy, which has led the world to where we are today. As they say… with friends like these, who needs enemies. Patrick J Buchanan – Is US Being Sucked Into Syria’s War? The Foundation for the Defense of Democracies is an annex of the Israeli lobby and a charter member of the War Party. Recent tweet from Yusha Yuseef, editor of Muraselon: High sources to me : All reports about arresting the syrian air-defence soldiers by Russian MP in Lattakia are totally false. Mileikowski. What’s his full name? Thank you. Thank you Ziad for your prompt post of the initial findings. I suspect that with thorough investigations ongoing, time will reveal more details. In the meantime the fervent theories being discussed by Sypers show extraordinary knowledge and passionate venture for the truth. However, they are at this time theories none-the-less. Personally I will wait for the availability of as much information as possible before deciding on how credible or otherwise the official versions are compared to the current and future theories. Kia kaha Syria and Sypers, we are all (mostly) on the same side, and make no mistake – we are winning. I hope Putin understands this was all setup by design by a certain ((( group ))). Regarding Russia’s ‘appropriate response’ to the zionist downing of their IL-20 EW platform & crew, Israel is currently sending a large delegation to Moscow which includes Major-General Amikam Norkin, Brigadier General Erez Maisel of the International Cooperation Unit and a large number of officers of the Intelligence and Operations directorates of the Israeli air force …..
…. presumably they will be flying into Moscow …..
…. seems to me Russia just got an opportunity for an appropriate response. Dear Ziad, Often I have expressed appreciation for your SyrPer creation – a wonderful gift to dear Syria, and to others supporting their important mission and assisting the quest for truth. This is the first time I comment about your wonder-humor so often included as you pass on sober research. Here’s your latest, about which I could not stop laughing > “The two taken into custody started warbling like nightingales explaining their relationship with American officers at Al-Tanf.” Thanks. It’s very important to bring you some on-the-ground coverage of what is taking place in Syria — something you will simply not get from the bought-and-paid-for Jewish controlled fake mainstream media. So joining me today, to discuss recent events, such as yesterday’s Israeli attacks in Syria, and the downed Il-20 Russian plane, and the 15 Russian lives that it took with it, is Vanessa Beeley, broadcasting direct from Syria, with the truth on the ground and her insight on these events. Wholly Krap!!! Is this significant? FRN is still looking for further confirmation of the following story. In response to the what Putin has called a ‘tragic incident’ that caused the death of the crew of the radio reconnaissance aircraft and the IL-20 VKS RF warhead, Rusvesna reports that the Russian military has made a major move. Stunned to read: “Syrian air defense units were not told about the Russian airplane.”Then reading notes about competence. Israelis knew about the Russian plane but Syrian air defence was not told. INCREDIBLE! I’ve always been in awe of Canthama’s analyses based on his contacts in Syria. The last thread illustrates the depth of technical knowledge of contributors like Whozhear and Igor. I am again in awe. I hope Russia has a replacement for the ELINT that can quickly be deployed. This firms up my view that it was one of the jew’s F-16s that shot down the Il-20M…..
Hmm. It appears things are unraveling domestically (https://www.zerohedge.com/news/2018-09-19/fbi-doj-defy-trump-order-redactions-planned-top-dems-demand-insuboordination) and financially (https://www.zerohedge.com/news/2018-09-20/dollar-dumping-bond-rout-spreads and https://www.zerohedge.com/news/2018-09-19/iran-sanctions-are-damaging-dollar) as well as militarily and diplomatically. Keep up the good work, Donald. Can someone give the amount of missile types of missiles fired against Syria during Mondays attack by Zionist Israel and Nato[FUKUS]? for example was itcruise missiles or air to surface missiles . Very little information compared to April2017\18 attacks whichrevealed 59 and 103 cruise missiles fired at Syria on that occasion. Is the lack of information due to the possibilty that it could reveal th Syria air defence wasnot responsible. Also the the lack of comment or acknowledgement by Syria for the downing of the plane could mean it is taking one for the team but won’t accept official responsibilty? US brings back the geriatrics..
High-altitude spy plane Lockheed U-2S (80-1076) US Air Force monitoring Russian navy.. Also 6 Russian bombers and a refueling tanker were intercepted off the English channel in a show of force to France..